There’s a lot of advice available regarding Town Planning, thousands of pages dedicated to what can be perceived as red tape but with a lot of jargon and confusing details. In general, they don’t tend to cover what you need to know in simple terms. This article for Wynyard Matters has been written by Helen Heward Associate at Planning House (& Wynyard Resident) to provide valuable information in order for people to be better informed about the planning process without being bogged down by unnecessary waffle. Town planning can be seen as ‘red tape’ however it is what controls how we build our neighbourhoods, it sets guidelines to make sure developments do not have adverse effects on their surroundings. It also protects listed buildings – buildings that we have deemed important to heritage, culture and history. Basically, it seeks to manage development to minimise impact. The National Planning Policy Framework, with supporting Planning Practice Guidance provides guidance for how Local Plans should be made and how planning decisions should be taken. Parish and Town Councils. Applications and all planning matters are handled by the relevant Local Planning Authority, for Wynyard this is either Stockton or Hartlepool Council depending on your location. The process of a planning application is relatively simple it’s the potential issues involved which sometimes aren’t. Once an application is submitted, it goes through a validation process whereby the Local Authority ensures all the required information accompanies the application and plans are accurate. Then the process of consultation is carried out where neighbours and various Council departments and external bodies, such as the Environment Agency or Highways England are notified and given a minimum of 21 days to respond. For some applications, depending on the type of development, site and press notices are posted which you may have seen on lampposts. Planning applications must be determined in accordance with the development plan unless material planning considerations indicate otherwise. The Local Authority have set timeframes in which they should determine applications, for instance; 8 weeks to determine minor applications, such as an extension to a home or 13-16 weeks for major applications. However, these timeframes can be extended with or without the agreement of the applicant. Often however are agreed where amended plans are submitted or additional information is required and further consultation is needed. Decisions on planning applications can be made either under delegated powers, which means that Planning Officers make a recommendation and it is signed off by a Team Leader or Manager, or by Planning Committee. Planning Committees are made up of elected members (Ward Councillors) from across the Borough who assess planning applications in public meetings and vote to determine the application. These decisions are informed by a Planning Officer report, members can, and sometimes do, go against officer recommendation and this is their democratic right. If your application is refused don’t despair, there is a statutory right to appeal against refusals of planning applications or if unacceptable conditions are imposed, however this is only open to the applicant. An appeal can also be lodged if the Local Authority do not determine the application within the agreed time. Be aware that there is no third party right of appeal, this means that an objector cannot appeal against an approval. Appeals are handled by the Planning Inspectorate on behalf of the Secretary of State and determined by Planning Inspectors who are independent from the Local Planning Authority. Following the grant of planning permission an applicant may have conditions that they have to comply with. It’s essential to know what conditions are attached, what they cover and how they can be complied with. In some cases, a further application may be required to be submitted with additional information to formally discharge a condition. This could be anything from drainage details or details of external materials for a new house or extension up to details of landscaping, play areas or car parking for a larger development. Not discharging or adhering to planning conditions means the applicant is in breach of their planning condition and enforcement action could be progressed by the Local Authority. A Breach of Condition Notice could be served which would require compliance to the condition. However, breaching a pre-commencement condition (a condition which prevents a start on site until a condition has been adhered to), could render your whole permission as null and void. Planning conditions cannot be imposed to secure financial contributions or relate to land outside of the application site boundary. Sometimes a decision can be subject to a legal agreement, often referred to as a section 106 agreement. These agreements often, but not always, secure financial contributions towards works in order to make a scheme acceptable. For example, housing developments may be required to contribute towards provision or improvements to cycle links, highway works or sports facilities. Prior to a planning application both Stockton and Hartlepool Borough Council operate a pre-application enquiry service where you can ask for planning advice regarding a proposed development, some Council’s charge for this service. There are many benefits to engaging with the Local Authority before submitting an application, for example if an issue is identified early this can give an opportunity for amendments to be made to overcome any problems at formal application stage, ultimately avoid delays and wasted expense. Town Planning is not rocket science, to help you know the basics of town planning, Planning House have prepared eBooklets covering just that, the Basics. If you want to look further into a particular topic more information can be found online very easily. These resources have been prepared as an easy read starting point, free of charge, no email collection before you can download and no sign up to a newsletter – no strings attached! All you need to do is go to the Planning House website, www.planninghouse.co.uk click the eBooklet and read it. Alternatively, should you wish to speak with a planning consultant please get in touch. Oh No I Don’t have Planning Permission! Northern Insight Magazine have published our latest article on the perils of selling a house without planning permission in place for works carried out and what options are available. The removal van was booked and champagne on ice ready to celebrate the start of a new chapter. It therefore came as a bit of a surprise to a client that planning permission was required for historic works carried out at their property and that this could potentially scupper their house sale. As background, I was contacted recently by someone in the final stages of selling their home, after they were requested to provide proof that they had (or didn’t need) planning permission for works they carried out. They approached their Local Planning Authority (LPA) who convinced them to submit a pre-application enquiry, then after several weeks were told planning permission was required and that they MUST apply for retrospective planning permission or a Certificate of Lawfulness of Existing Use or Development (CLEUD). Naturally they were anxious and confused. In this case the works had been carried out 14 years ago and whilst having the relevant paperwork in place is preferred, there are a few things to keep in mind. The salient point is the length of time the works had been completed. • Within 10 years for any other breach of planning control (essentially other change of use). If a development has been carried out in excess of the above timeframes anyone can apply for a CLEUD which seeks to prove that the development or use has existed for the required period of time. The onus lies with the applicant to provide precise and unambiguous proof, if the LPA have no evidence to the contrary and the balance of probabilities lies with the applicant the LPA will grant a certificate. The Council cannot however require someone to apply for a CLEUD and if you have evidence to support the length of time a development has existed enforcement action will not be taken by the LPA just because you haven’t applied for a CLEUD. A CLEUD is the formal legal document to confirm the development needed permission, but it’s over the timescale for enforcement and therefore now considered lawful. The process can take as long as a planning application to determine and requires the same planning fee as a new proposal. There is another option if you’ve carried out works but have not exceeded the ‘immunity’ timescales above, retrospective planning permission can be applied for, however just because your extension maybe build doesn’t mean it will automatically be granted. The LPA will consider the merits of the scheme and if it doesn’t comply with National or Local guidelines/policy then it can be refused. In terms of a house sale there maybe other ways to progress without going through the CLEUD or retrospective planning application routes, for instance, I know of cases where an Indemnity Insurance to cover the works has been sufficient to allow a sale to complete. This is generally in cases where the works exceed the ‘immunity’ timescales and therefore enforcement action will not be progressed by the LPA. I’m in no way advocating development without the relevant consents as it can become a lot more complicated than the example I’ve used. It’s not illegal to carried out development without the relevant consents (unless it’s a Listed Building) and scenarios such as this happen regularly so if you find yourself in a situation like this consider your options. Edward Vaudin took over writing the Northern Insight magazine article this month, his piece on What Town Planning is informative and thought provoking. A range of FREE EBOOKS are also available, one of which covers What is Town Planning. Think about where you live, where is your local shop? Where is the nearest park? Where can you get something nice to eat? Are these places easy to get to? You would probably like to improve things where you live, maybe there needs to be more shops or things to do. Once you start thinking about these improvements, where would you put them? Where can they go? Apply this to other aspects of your local area like new homes for the growing population and you will start to realise how many important questions need to be answered about the places we live; these places have communities that have and will exist for years to come. People are in general passionate about where they live. However, are they fully aware that the decisions made on ‘what goes where’ could impact the community for generations? Over time, different people have voiced their ideas, some have succeeded, and some have failed, but throughout we have come together to work on a system that supports everyone, everywhere. As much as I find people passionate about the places they live, they see planning as somewhat of a mystery or a barrier. So, what is the system? What is town planning? Town planning is what controls how we build our neighbourhoods, our towns, our cities, how we build our surroundings. Importantly how we shape our communities. Town planning sets guidelines to make sure developments do not have adverse effects on their surroundings. It also protects listed buildings – buildings that we have deemed important to heritage, culture and history. It is also important to protect our green spaces and countryside. Imagine if there were no rules on where you could build! Areas of Outstanding Natural Beauty could be disrupted with inappropriate development and habitats could be destroyed, driving away nature. National planning policy is laid out in the National Planning Policy Framework; it provides guidance for how local plans should be made and how to approach supporting local needs by promoting sustainable development in terms of economic, social and environmental needs. Most planning matters are handled by the second tier of councils; this can vary from place to place. Areas that have parish or town councils can provide more location specified plans called neighbourhood plans which form part of policy that are used to make decisions in planning. Communities generally have Councillors to represent people and their aspirations in terms of how a place develops. Councillors may sit on planning committees to make decisions on planning applications and local plans, but all of us are responsible for shaping the area we live. In my opinion engagement is the key to shaping communities without it the Town Planning system fails to be effective. If you’re asked for your views on a proposal or an emerging local plan take time to think of your vision for the area and needs of the community and have your voice heard by participating. #planninghelp#townplanningEdward VaudinTown Planning in the North EastWhat is Town Planning? Have you ever looked at a barn or building in the countryside and thought that would make an amazing home, then thought about the hoops you would have to jump through to actually secure permission to convert it? Well think again, in some instances you don’t need planning permission to convert a building to residential use. Chris Pipe explores this in this months Northern Insight Magazine. Under Part 3 of the Town and Country Planning (General Permitted Development Order) England, GPDO for short, there are a multitude of uses (retail, launderette, betting shop, offices, amusement arcade, casino, storage or distribution centres, premises in light industry, agricultural buildings, etc) which can be converted to residential as ‘Permitted Development’ without planning permission. Naturally there is a range of exclusions and limitations which apply to these permitted development rights, and each use proposed to be changed has a different set of conditions which must be adhered to. The ‘green light’ given to convert specific uses to residential has seen an increase in growth of conversions, particularly agricultural buildings in the countryside. However, with the Government encouraging the creation of more housing, permitted development rights have recently been increased. – a mix of both, within a total of no more than five homes, of which no more than three may be larger homes. Notwithstanding if you believe your agricultural conversion may be permitted development you will still need to contact your local planning authority and embark on a prior approval process. Prior approval means that a developer has to seek approval from the local planning authority that specified elements of the development are acceptable before work can proceed  in effect a ‘light-touch’ planning application. Also, be aware that development carried out using permitted development rights can still be liable to pay a Community Infrastructure Levy (CIL), if there is a community levy in place and if the development does not qualify for an exemption. As well as the potential to create you dream home in the countryside (or maximise land and development value), there are many ways to circumvent the need for planning permission for extensions, alterations, change of use, temporary buildings and uses etc. However, interpreting the regulations which set out what can and can’t be done via permitted development rights can be daunting so if in doubt ask an expert. Barn conversionsClever conversionsFast Track ConversionsHow do I do a barn conversionPlannig in DurhamPlanning in the North EastTown planners in DurhamWhat is the rules on converting a barn? Did you always envisage a career in the industry? Initially I thought my calling was as a Geography Teacher, however I realised through studying A-levels (Sociology, Geography and Classical Studies) and analysing the changes the area I lived had gone through in the 90’s (an ex-mining settlement) that my passion was to try and make a difference to people/places and that began a passion for town planning. What is your favourite aspect of the job? 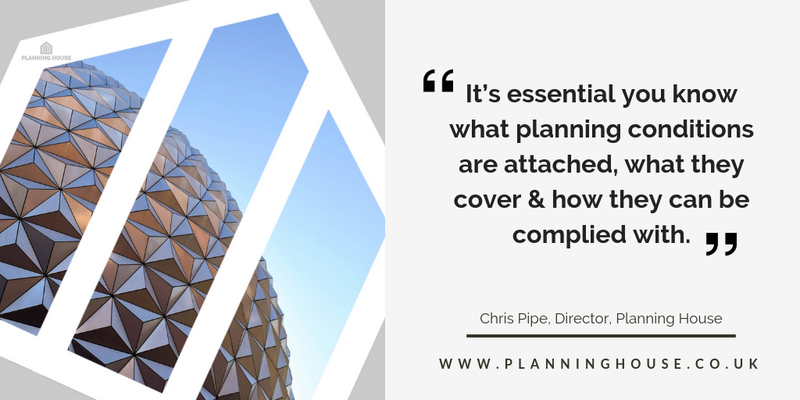 One of the perks about town planning is each project is different, residential, commercial, change of use and listed building projects all have their own set of planning issues which need to be factored into how you deal with a proposal. I thrive on knowing each day can be different. What has been your career defining moment? Whilst I’ve been fortunate to have some great achievements in my career I believe that starting my own business is by far my career defining moment, I do however believe my greatest business achievement is yet to come. How do you measure success? I love a challenge and strive for success however client satisfaction is my key measure as I want to ensure that I add value to a development. This is why I agreed to be a Grand Design Live Ask the Expert at the London ExCel in May, I provided advice and guidance to people embarking on their development journey. What have been the biggest changes in the industry since you started? Town planning constantly evolves however the biggest change in town planning during my career came in 2012 with the introduction of the National Planning Policy Framework (NPPF) which turned the thousands of pages of national policy into a 59 page document. Whilst the interpretation of the NPPF is still being challenged and is currently being reviewed I do believe that this document has helped professions remember planning is about people and places not red tape. How has your skillset developed accordingly? I realised town planning is bigger than just looking at policies and regulations, at the end of the day as already said, it’s about people and places, once I embraced that I became a better town planner. I was working as Head of Planning for a Local Planning Authority when the NPPF was launched and whilst my experience was invaluable until you work in private practice I don’t think you can truly appreciate the challenges developers face. Are you a risk taker by nature or more conservative? I think if you set up your own business there is a part of you which is a risk taker, however I like to weigh up risks before I act. To what would you attribute your success? I have a strong work ethic and whilst I have maintained my focus I’m open to criticism and advice on ways to improve. However ultimately you have to love what you do – and I do. What’s your biggest weakness and how have you managed this? I have so many ideas for taking my business forward sometimes it’s challenging to find time to work on and in the business at the same time. My growth plans for the next few years will however help with this. How do you remain motivated? Ultimately success, I have a strong desire to achieve my goals and feel empowered knowing my business direction, this drives me and keeps me motivated. Would you prefer to be liked or respected? Whilst not mutually exclusive I’d prefer to be respected, its nice to be liked however if you’re respected it means you’re appreciated and valued in your profession. I’ll retire when…. The business is at a stage where it no longer needs me. I have a passion for town planning, however my plan is to build the business so my role becomes increasingly more limited to enable me to spend more quality time with my family.